The San Jose Mercury News reports that a 47 year old man named Jing Hua Wu, after being laid off from his job at a fabless digital radio semiconductor startup in Santa Clara called SiPort, came back to the office on Friday afternoon with a gun and killed three people. Sid Agrawal, the company?s CEO, and Brian Pugh, VP Operations, were killed along with one other as yet unidentified woman. Wu is still at large according to the latest reports. It’s been a while since I put up a real post, my daily Twitter digests took up the first page of my blog quickly. I’ve always considered moving to China, or Asia in general, to do startups or consulting. Our friend Jimmy decided to go to business school in Shanghai, so I went there to check out the city and to see how are things there. 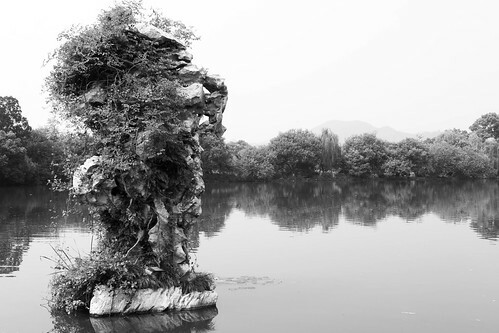 I hadn’t been to China for over 10 years. Before that we stopped by Taipei as Sherry had to be there to help her mom purchase an investment property in her name. Other than the extremely humid and hot weather it was a great trip. Taipei is really growing on me, the food and the shopping are pretty decent. Tuan Tuan had most of the brands I like: N(N), UC, Margiela, Hysteric Glamour, CDG, etc. There is also an Undecover store that is always fun to visit. I was in Taipei on the Olympic opening day, but I missed the broadcast as I was jetlagged and pretty much passed out after watching part of the parade. We flew from Taipei to Shanghai, and with EVA airline now you can fly direct! Well, the plane still goes over to Hong Kong and then back up, but it doesn’t have to stop at Hong Kong. So the flight now is only about 2 and a half hours, before it takes pretty much the whole day to travel from Taiwan to Shanghai as you would have to land in Hong Kong and then take off later, and Hong Kong is a pretty busy airport so that takes a while. 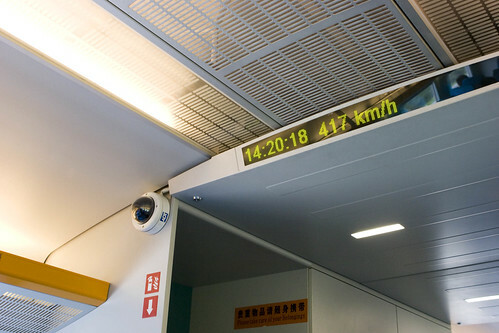 We got off the plane at PVG and got on the Maglev, it was a pretty cool experience, the train went up to 430km/h (~269mph), and took only 6 minutes to get to the middle of Shanghai, I believe the distance is about 18.6 miles. (on our way back to PVG the train didn’t go nearly as fast, not sure why). 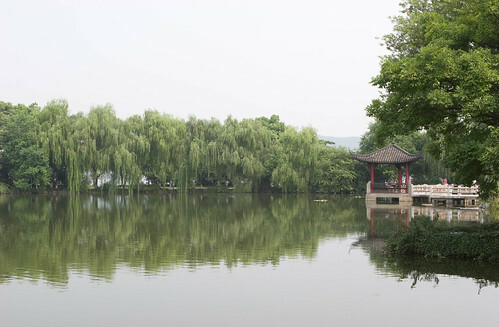 We spent a day in Shanghai and then went to West Lake (?? 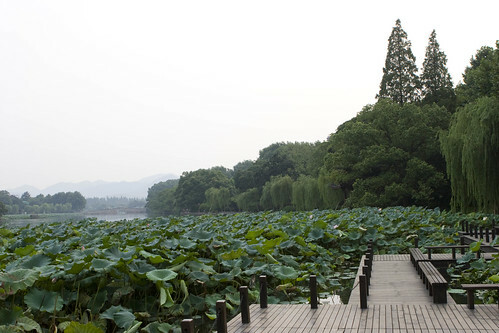 ),a famous fresh water lake in Hangzhou. The first night in Shanghai we went out with Jimmy and went to a the German theme bar in Xin Tian Di (??? ), we were pretty tired from traveling and just had a few beer there. The band there was really terrible that night. Xin Tian Di was a really nice area to hang out though, it pretty much feels like you’re in the States, they have cafes and restaurants with outdoor seating and shops like Shanghai Tang. 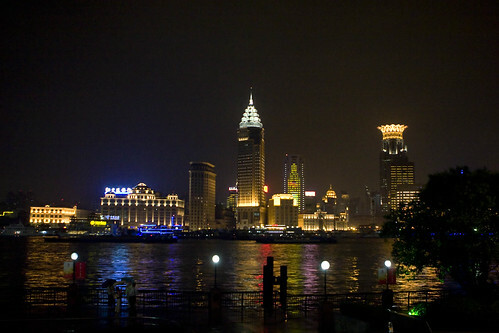 The highlight for us at Bar Rouge wasn’t the view of Pudong, it was observing how the Shanghainese “pros” work the bar. 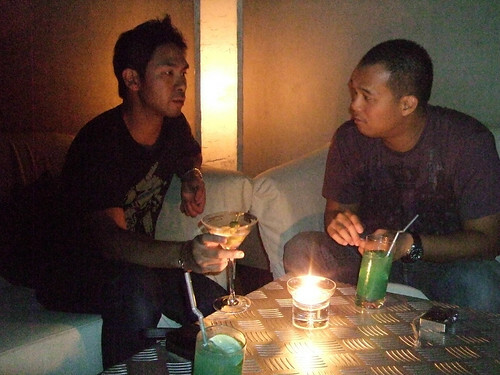 It was really efficient, they approached mostly foreigners, most of them look like they had never been in a lounge/bar/club before, started dancing with them closely within a few seconds, and in a few minutes they’d start making out, in about 15 minutes they would leave together. We were all pretty shocked, and that was everywhere around the bar! 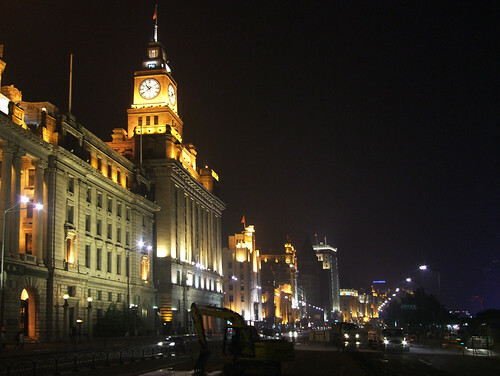 The Bund, taken from outside Häagen-Dazs. The coolest area we visited was Taikang Lu(??? ), it offers art-influenced shopping from up-and-coming artists. It maintains the original old Shanghainese buildings, and you would see people’s houses/apartments right next to remodeled store units. There are also quite a few restaurants and bars that offer outdoor seating, possibly a great place to hang out in the evenings when it’s not as hot. Our last night there we hit up a place called People 7, I found it from reading the Shanghai thread on superjetset. It was one of the coolest bars I’ve been to. To open the door you have to figure out which 2 lanterns to place your hands into. The place was Taiwanese-owned, they have a couple bars in Taipei as well. We spent another day in Taipei, didn’t do much that day, went to Orange (?????) for some really good shabushabu. I didn’t take any pictures of the food but this guy took some great ones. After dinner we stopped by the Audio-Technica store to auditioned the ATH-A900’s. They were highly recommended by my headfi friend Steve. I’ve wanted to check those out for over 4 years and never got a chance to. They sounded great, so I picked up a pair. They could be had for a bit cheaper online here in the States but I got to audition them there with proper source and their service was great. They also threw in 2 A-T cable organizers. Over the ears closed cans are much more suitable for using at home than my custom in-ear monitors. Also other people can use them as they’re not customized to my ear canals like my IEMs. Internet access is kindda important to me, especially when I couldn’t yet unlock my iPhone 3G to use in Taiwan and China. In Taipei pretty much anywhere you go within the city limit you can get WiFi via WiFly. You can get access cards with username and password for daily usage for about $3 USD at any Starbucks. There are other plans that are all dirt cheap, like an annual unlimited plan for iPod Touch for about $33 USD. In Shanghai we found free wifi at all Coffee Beans & Tea Leaf locations, Cafe du Paris, Esy Cafe in Taikang Lu, and another coffee chain that I can’t remember the name right now. They have paid wifi at all Starbucks and I believe McD as well, but it was hard to pay for access without a Chinese cellphone (or SIM card). Part of the Taiwan airport has free wifi as well. One thing I found strange was that most stores in China don’t accept credit cards like VISA, MC, or AMEX. Even a Nike store didn’t take them. 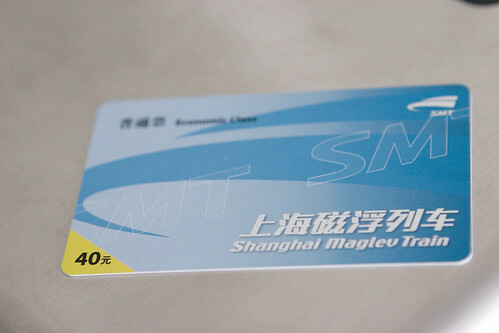 If you have a Chinese bank account they have something like our debit cards that is accepted at a lot of places, I believe the taxis also take those. btw, taxi in Shanghai is really really cheap, a 30-minute ride (maybe around 20 miles?) costs only about $6 USD. I brought my running gears there but only ran once, and it was only a 5-mile run. The main problem was that I didn’t know the places and routes well enough to do more than that. Even with the 5 miles I had to loop around the same area a few times. In SF I can easily run 10+ miles by going half of that one way and just turn back. My favorite route is from my apartment in North Beach out to the Wharf, up toward Fort Mason, down to the Marina and then out to Crissy Fields and the Golden Gate Bridge, the view is spectacular. It’s a shame that I didn’t really get a chance to check out the high tech and startup/business scenes in China. Next time I go there I’ll have to setup some meetings first. This is about it for now, I have more updates to post but I will save those for another time. I am typing this up 4am in the morning as I went to bed at 10pm and got up at around 3am. I am still a bit jetlagged. this is cool: where the hell is Matt?